The results of a consumer survey released on Tuesday show that iTunes' video store is at the top of a 22-company list that includes U.S. content delivery heavyweights like HBO, Netflix and Amazon. Customer service analytics research firm ForeSee's Mobile Satisfaction Index: Media and Entertainment Edition for 2013 found iTunes to be the top digital video consumption platform in America, scoring 80 out of 100 points. The average for the category was 78. Trailing iTunes were video streaming services like HBO GO and Netflix, which rated 79 points. In third with 78 points was Amazon Instant, while Crackle and Hulu Plus both managed 75 on the scale. While iTunes is not a true streaming service in the strictest definition of the word, Apple's solution dose stream content through iOS devices. ForeSee found it "germane and prudent" to include iTunes in the study. "iTunes is the de facto experience when consumers are using Apple's iOS platform," the study said. "The iTunes app comes pre-installed on iPhones and iPads. It is a significant market advantage that users do not have to elect to download the app. Also, it provides guidance to other content and media apps since the iTunes app's user experience has become the standard for how other apps look, feel, and behave. Millions of consumers then actively choose to engage with iTunes to download content." The fact that iTunes requires at least a section of a TV show or movie to buffer before playing was a huge factor in the survey's results, as respondents were most critical of load times and stream quality. "With the fast pace of consumer adoption of smartphones and tablets, companies need to recognize the mobile platform is at least as important as the desktop web environment," said ForeSee President and CEO Larry Freed. 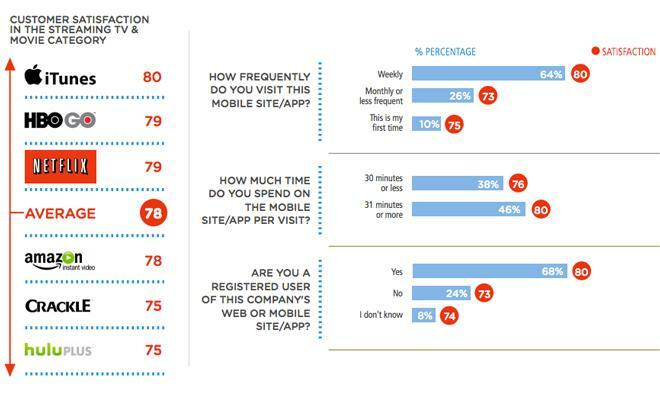 "These mobile benchmark scores suggest there is much work to be done. Companies see the opportunity and they are trying to move fast, but they must be sure to do things the right way to meet the expectations of customers or risk turning them away to competitors."